The Philadelphia Student Union led a protest against police violence at the School District headquarters on May 11. 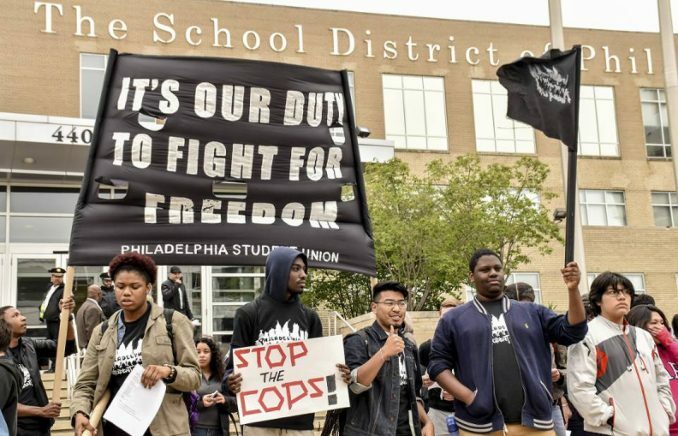 The Philadelphia Student Union, one of a handful of youth-organizing groups in the city, led a protest on the steps of the Philadelphia School District headquarters on May 11. Students, parents, teachers, community members and City Council member Helen Gym spoke about police violence experienced by Black and Brown public school students here. In 2016, a student at Benjamin Franklin High School was assaulted by police officer Jeffrey Maciocha in a third-floor hallway as the student was trying to find a bathroom. The bathrooms on the other floors were all locked — a practice that is evidence of the criminalization of Black youth, who are not even trusted or permitted to freely use bathrooms! There is a graphic 13-second video of the student on the ground in what appears to be a chokehold, reminiscent of Eric Garner’s murder by New York police officers in July 2014. In response to the 2016 assault, the school district agreed to create a system so that complaints can be filed against school police officers, a demand set forth by PSU. However, the district’s complaint system is sorely lacking and does not address the demands made by PSU. The school district has failed to identify exactly how and where students can make complaints. Plus the system is only online, making it largely inaccessible to students without computer access. The school district, not an independent entity, will handle oversight of the complaint system. Already unaccountable to its students, and with a vested interested in protecting the police officers placed in schools, the school district will be the only entity investigating the complaints. Moreover, the complaint system is not open to the larger Philadelphia community, whose members often experience violence and harassment at the hands of school police. With lack of independent oversight, it is not difficult to imagine how many more voices of Philadelphia’s Black, Brown and other poor and oppressed students will be ignored. Several students who spoke at the rally noted that many district schools have more police officers than guidance counselors. Policing in a capitalist country, where wealth was built on the backs of slaves, poor people and immigrants and on stolen Indigenous land, is inherently racist and biased according to class. What the student at Benjamin Franklin High School experienced is the exertion of control over his Black body by a white supremacist institution. What is the purpose of policing in schools? To protect students? It is clear that marginalized and oppressed students need to be protected from police officers, as they all serve to keep oppressed peoples in their “place.” It is not enough to be anti-police brutality. We must be completely anti-police. The struggle against police harassment and occupation of our schools is directly linked to the struggle against police harassment and occupation at Standing Rock; against Immigration, Customs and Enforcement harassment and deportation faced by immigrants; against the Israeli occupation of Palestinian land; against the political repression and budget cuts in Puerto Rico; and so on. 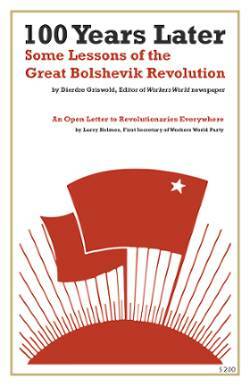 We must unite against imperialism, capitalism and white supremacy!